Osiyan is situated 58 km (via Umednagar) to the north-west Jodhpur in Rajasthan. Osiyan is the major site, containing monuments spanning 5 centuries of artistic evolution. There are several beautiful temples and shrines, oldest among them being the Sun temple. The doorway to this temple is one of the finest to be seen anywhere in India. The Harihara I temple, dating back to 750 A.D., is a ‘panchayatan’ temple, which means that a central shrine is surrounded by four other smaller ones. It stands on a beautifully decorated terrace with thirteen inches build into its sides.The main temple carries some excellent earlier figural sculptures. 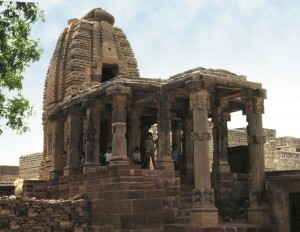 The Harihara III temple was built was around 800 A.D. The walls of its rectangular sanctum carry exuberant decoration, tastefully executed. There is open hall, the aisles of which have been provided with a beautiful sloping ceiling support by rafters, shaped like ‘Nagas’. Harihara III is one of the finest examples in India of exuberance going hand in hand with architectural strength. Harihara II adjoining Harihara III is a somewhat less well-finished copy of Harihara I. Apart from this there is the main Sun temple, and other temple. A unique feature of this temple is that most of them face the west. This entry was posted in Osiyan, Rajasthan and tagged Sun temple, Surya Mandir, Surya temple. Bookmark the permalink.